Our sweet Mary-Michael (May-May) gained her wings on April 12, 2019 and is now our angel. 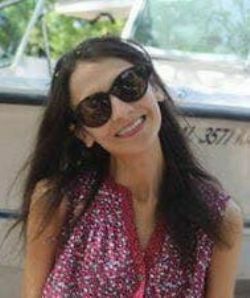 May-May passed away at her home surrounded in love by her family after a courageous battle with anorexia. The love that May-May shared with all she met has taught all those she left behind to both be strong and loving. In Mary-Michael’s last months, she bravely, with the help of her family, raised awareness for The National Eating Disorder Association in many different ways. The following link will direct you to an interview that highlights her courageous battle and has been viewed over 18 thousand times: https://www.facebook.com/hopecenter4healing/posts/960319784177168 Our prayer is that her story will continue to raise awareness and provide healing to those also suffering. Mary-Michael was born on March 26, 1983 in Mobile, AL. She attended Holy Family Catholic School and McGill-Toolen Catholic High School. She is survived by her mother, Betty Nonnenmacher and her father Mike (Maryanne) Nonnenmacher. One of her biggest loves was her family. Mary Michael had two brothers, Lloyd (Heather) White and Mikey (Allison) Nonnenmacher. She had four sisters, Melissa (Drew) Overstreet, Amy (David) Lynn, Jenny (Chris) Reber and Theresa (James) Yarbrough. She also leaves behind 12 nieces and nephews: Justin Lynn, Rebecca Nonnenmacher, Bryce Lynn, Mary-Margaret Overstreet, Riley Reber, Grace Overstreet, Sadie Reber, Andrew Overstreet, Cole Thompson, Walt Yarbrough, and Liza Yarbrough and one great nephew, Brooks Christian all of whom she adored and loved to spoil. We Love you High As the Sky May-May! We promise to all use the strength you have given us to spread love the way you have shown us. Mass of the Christian Burial will be Celebrated from Holy Family Catholic Church on Monday, April 15, 2019 at 10 am. Visitation will be Sunday evening from 5 to 7 pm at Mobile Memorial Gardens Funeral Home. A church service will be held 10am on Monday 04/15/2019 from Holy Family Church, followed by a committal service at the grave site.